Is it finished yet? Please tell me some merry elves snuck into my house last night and hung that last set of lights and put away the final box of Christmas decor for us. I so enjoy decorating for the season, but, man, I am taking soooo long to get to it and through it all this year! Nevertheless, I've managed to put up all of my favorites, and I'd thought I'd share them with you. I loooove seeing other people's holiday decor, learning new traditions, sharing great ideas so I'm hoping that if I show you some of mine... well, you'll show me yours, too! Hence the hashtag #deckingyourhalls. Our decorations are simple and mostly homemade so this hashtag is far from showing off a glorious masterpiece display (but if you have one, share that, too! ), and it's the longtime treasured objects or sweet new items that I'm hoping to highlight and reshare with all of you. So join in!! I'll be sharing photographs next Tuesday right here! If you follow Pars Caeli on Instagram (we are friends over there, too, right? @parscaeli), you noticed that my children put up their trees this weekend, and each one reflects a different spirit and joy! My oldest daughter, M, in particular has a special story behind her Christmas tree that I'll be sharing tomorrow here and other places so stay tuned. 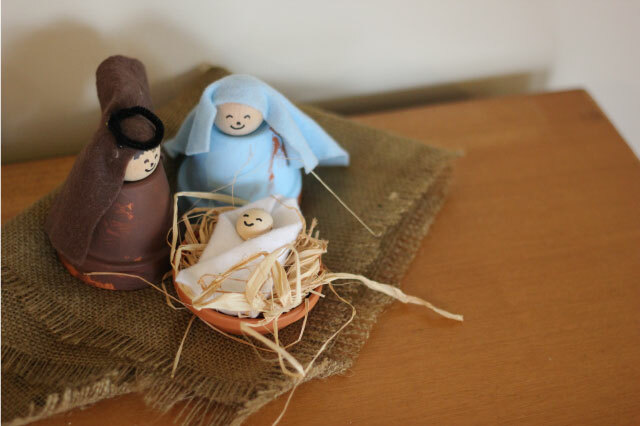 This simple nativity scene that my daughter, C, made at preschool when she was four. Preschool teachers, you do not get enough credit for the innovative projects you develop and complete for little hands. These terra cotta pots and bases, painted and assembled by C are a charming reminder to us of the simplicity of the season. The Santa Pole is standing proudly in our dining room. A friend made this for us many years ago from lumber, caulking, a Santa hat, and clever painting. We turned it into our Santa Pole, and we use it every Christmas season to measure the height of each child. I love hearing them talk amongst themselves about how "little" they used to be! Decking the halls big and small, each child adds holiday cheer to their rooms. My grandmother-in-law is a whiz with plastic canvas, and she's made us nearly 100 ornaments. We strung them into a garland for my son's firehouse decorations. We are a house of many Nativity sets, and this year our largest is right by the front door. It fits with how we interact with the scene. I once learned from one of my fifth grade students an activity leading up to Christmas. When family members were helpful and especially kind to one another, they put a string in Jesus's manger to keep him warm and soften his rest. We began this tradition when the children were toddlers and have kept it up. Next to the Holy Family we keep a carved, heart-shaped bowl, filled with red and green string for our children to use to make a cozy manger. Sweet and simple. More to share with you!! I hope you'll let us take a look into how you make the season bright at home. Don't forget to add #deckingyourhalls to your photos and tweets!